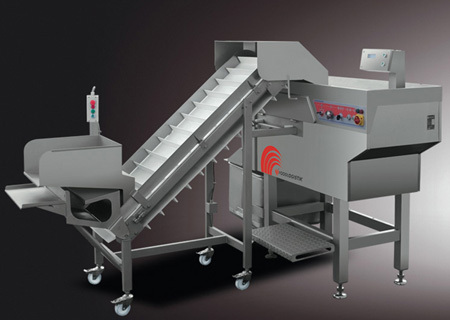 Standard features of ALL CrozzdicR automatic controlled guillotine cross knife, no cutting down to size required which reduces costs and saves time plus the possibility to automate the feeding. Solid stainless steel grid sets, fourfold attached, designed for hardest workload. 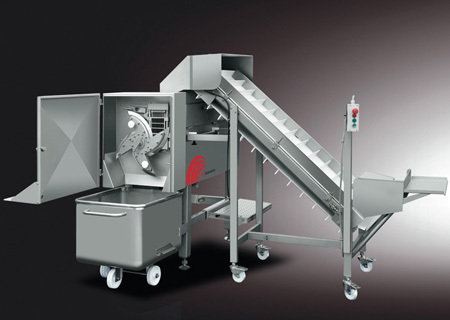 Product outfeed for driving 200 litre trolleys underneath machine or conveyor belt (option). Leftover removal through large stainless steel drain pipes for best hygenic standard. High quality SIEMENS Computer Processing Units guarantee best reliability. Stepwise and continuous feed motion mode a standard fitting, marginal santizing expenses for best hygiene. Subscribe to our NEW You Tube Channel.